Manouevres was released in 1983 as the follow-up to Greg Lake's 1981 self-titled debut album. His core group of musicians (Gary Moore, Tristam Margetts, Tommy Eyre, and Ted McKenna) is still present, but Manoeuvres is a different sort of album than the '81 effort. The heavy, gritty, guitar-driven feel of the previous record is not quite as evident and this seems a more restrained album. Many, Greg Lake included, tend to sell this album short and that is a mistake. Perhaps sales were discouraging, but this is a well-crafted, well-performed album on which Lake seems to rely more on melody than he did in 1981. A few of the heavier numbers, such as the title track, are reminiscent of '81, but it is on the ballads that the album goes its own way. Lake shows why, through all of powerful and complex music of the ELP years, it was the ballads which always seemed to fair best commercially. He writes a good song like very few can, and the fact that he delivers every song with such fantastic vocal ability makes this album succeed. Definitely worth a second listen, Manoeuvres is more than it seems on the surface. Lake learned to read music and also to play pieces by Paganini, among other classical composers, but his aspirations lay with emulating the sound of his favorite band of the era, Cliff Richard & the Shadows, and their lead guitarist, Hank B. Marvin. Lake passed through a succession of groups, including a local quartet called Unit Four, in which he played guitar and sang. He and Unit Four guitarist David Genes later formed the Time Checks, and, still later -- around 1967 -- with another Unit Four member, John Dickinson, was a member of a band called the Shame, who cut a single in 1968. He also sang on a record by a band called the Shy Limbs. In 1968, Lake succeeded Mick Taylor as a member of an outfit called the Gods, whose other members included future Uriah Heep founders Ken Hensley (keyboards, vocals) and Lee Kerslake (drums), and it was there that his songwriting first blossomed. He left the Gods just before they began to record, having been approached by his boyhood friend Robert Fripp to join the outfit that he was putting together out of a failed trio called Giles, Giles & Fripp -- Lake joined the quintet (Fripp on lead guitar; Ian McDonald on keyboards, saxes, and flute; Michael Giles on drums; and Peter Sinfield as lyricist) as lead singer and bassist. King Crimson proceeded to carve out a name for themselves unique in the history of rock music as the leading progressive rock band of their era. Their first album, In the Court of the Crimson King, became the standard for serious progressive rock albums. Lake, along with the others, was suddenly a star. That first lineup of the band only lasted a year -- by December of 1969, Giles and McDonald were tired of touring and opted out, and Lake refused to continue working with the group, although he stayed around long enough to sing on the second King Crimson album, In the Wake of Poseidon (1970). At the suggestion of Tony Stratton-Smith, Lake was approached by keyboard player Keith Emerson, who was in the process of putting together a new group after three years with his current band, the Nice. The latter group's main fault was its lack of a real lead singer, and Emerson saw in Lake -- whose voice had dominated In the Court of the Crimson King -- the solution to that problem. The two eventually recruited drummer Carl Palmer and formed progressive rock's first supergroup, Emerson, Lake & Palmer, who were a success from their self-titled first album, released in 1970, which closed with Lake's old song ''Lucky Man.'' The latter became one of the group's few successful singles, one of their rare attempts to compete on AM radio -- it also turned Lake into one of the most familiar voices in progressive rock, rivaling such figures as the Moody Blues' Justin Hayward. Lake's production experience as a member of King Crimson (who had produced their own debut album) also served ELP in good stead, and his songwriting became the creative nucleus for the group's first three studio albums. ELP dominated the charts and the field of progressive rock right up until 1977, by which time the entire genre of ''art rock'' was beginning to lose popularity. The stresses between the trio members caused them to split up after a tour in 1979, and Lake embarked on a solo career. 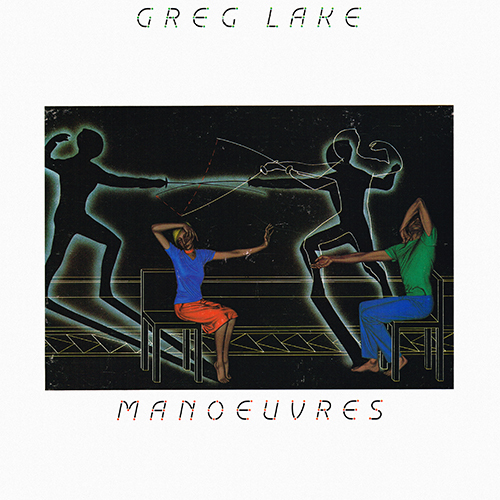 Lake organized a new band with ex-Thin Lizzy guitarist Gary Moore on lead guitar, Rory Gallagher alumnus Ted McKenna on drums, and ex-Joe Cocker/Gerry Rafferty keyboard player Tommy Eyre, and recorded Lake's first solo album, Greg Lake (1981). The sound on that record was very different from ELP, as it was dominated by guitars, rather than keyboards, and featured Lake singing in a harder, more aggressive style. On tour he covered material going back to the King Crimson days, but he also regaled audiences with pumping versions of the new songs. A second album, Manoeuvres, followed in 1983, but by that time the creative and commercial bloom was off the rose, and Lake took his first break from music. He appeared in 1985 as the lead singer of Asia during that group's tour, but he didn't remain with the band. In 1986, he re-teamed with Emerson and drummer Cozy Powell as Emerson, Lake & Powell, and recorded an album for Mercury Records, which was followed by a world tour. After a stint with ex-Asia member Geoff Downes and King Crimson drummer Michael Giles in a group called Ride the Tiger, Lake re-teamed with Emerson and Palmer for a film that was never finished, which led to their first new album in 13 years, Black Moon (1992). During the mid- and late '90s, Lake continued to work with Emerson and Palmer, while pursuing his solo work as well. The latter included a 1994 tour of the United States. He had also done a considerable amount of charitable work on behalf of missing children, and his song ''Daddy,'' written in response to one such case, which ended tragically, achieved national exposure as a theme for a television series devoted to the plight of missing children. In the 21st century Lake continued to tour with his Greg Lake Band, and a reunited ELP performed a one-off show at a London rock festival in 2010. After a battle with cancer, Lake died in December 2016 at the age of 69, nine months after Keith Emerson committed suicide in March of the same year.